Ramelteon is a novel melatonin receptor agonist for human MT1 and MT2 receptors and chick forebrain melatonin receptors with Ki of 14 pM, 112 pM and 23.1 pM, respectively. (A) CLSM images of Porphyromonas gingivalis biofilm formed in the presence of melatonin and ramelteon at sub-MIC concentrations. Biofilm-forming cells were stained using the Live/Dead Bacterial Viability Kit. Dead cells were stained red, whereas live bacteria were stained green. In the presence of 50 μg/mL or 25 μg/mL ramelteon, the areas of biofilm formation were narrower than that of vehicle controls. Bars = 50 μm. Melatonin is a MT receptor agonist, used as a dietary supplement. TUNEL staining of treated adipocytes and flow cytometry analysis of positive TUNEL cells (n=3). 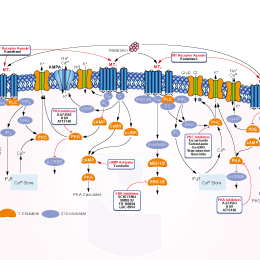 Tasimelteon is a selective dual melatonin receptor (MT1/MT2) agonist with 2.1-4.4 times greater affinity for the MT2 receptor believed to mediate circadian rhythm phase-shifting (Ki = 0.0692 nM and Ki = 0.17 nM in NIH-3T3 and CHOeK1 cells, respectively), than for the MT1 receptor (Ki = 0.304 nM and Ki = 0.35 nM, respectively).